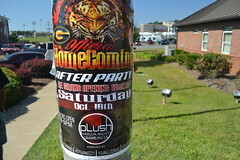 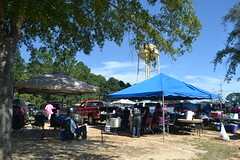 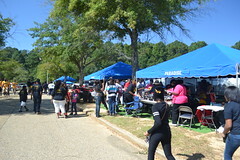 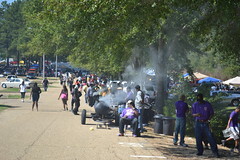 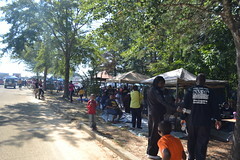 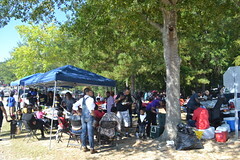 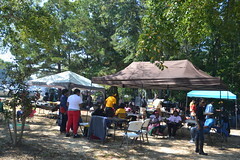 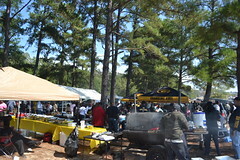 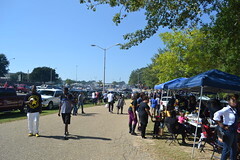 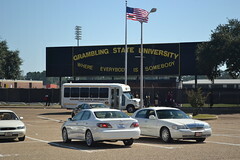 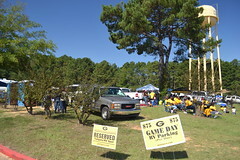 On Grambling Homecoming weekend, the wooded area near Robinson Stadium is filled with tailgaters from all over the country. 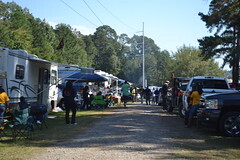 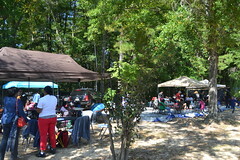 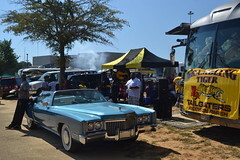 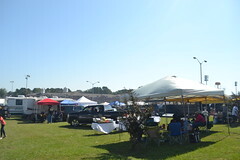 Some are just simple tents that have been set up with barbecue grills, while others are elaborate motor homes, and some large tailgate parties have DJ’s playing the latest soul, blues or occasionally rap. 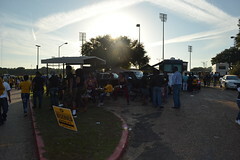 The smell of barbecuing meat drifts all over the area, even to the stadium. 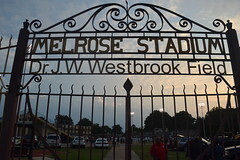 Despite Memphis’ well-deserved basketball reputation, Memphis is also traditionally a strong football town, particularly at the prep level. 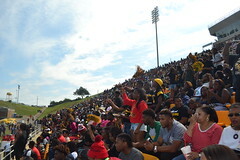 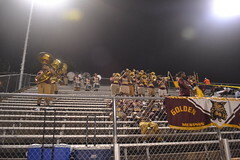 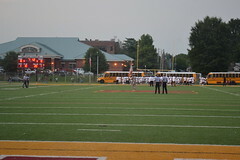 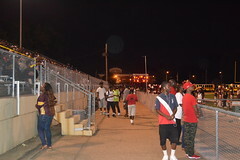 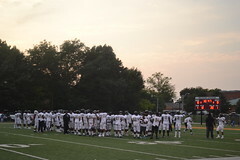 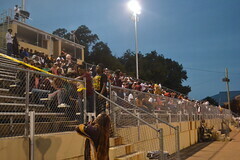 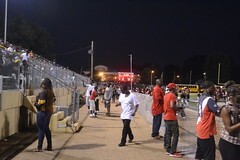 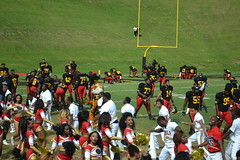 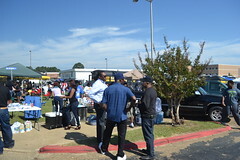 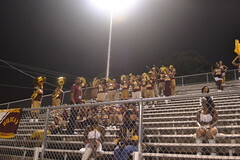 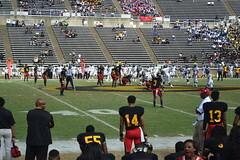 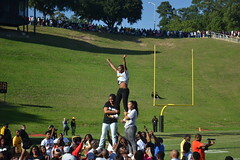 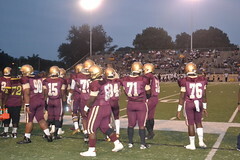 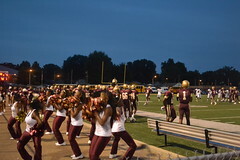 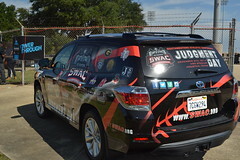 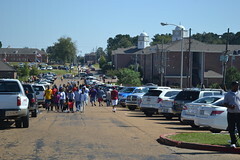 People turn out to see both the ball game, and also the battle between the bands and drumlins as well, and certain stadiums are historic locations for Memphis Black high school football, such as Booker T. Washington Stadium in South Memphis or Melrose Stadium in the center of Orange Mound. 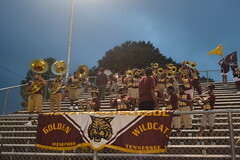 On Friday, September 19, 2014, I went out to the latter stadium to see the game between Whitehaven High School and the Melrose High School Golden Wildcats. 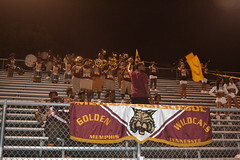 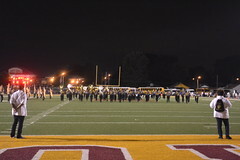 Both schools brought their marching bands to the game, which isn’t always the case in Memphis these days, but Melrose seems to have declined in numbers in recent years, and its band, though it sounded good, was far smaller than I remembered in the past. 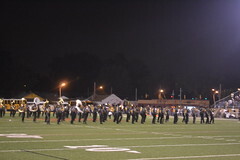 Whitehaven, on the other hand, is one of the city’s premier high schools, academically, athletically and musically. 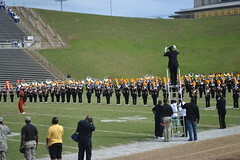 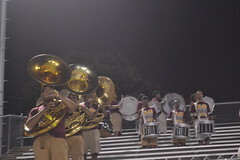 Its band marches more than 100 members, and looks and sounds better than many colleges. 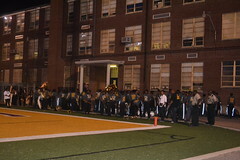 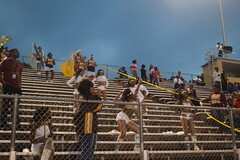 The football game was a runaway for Whitehaven, but the band battle was more evenly matched, although I would have to give Whitehaven the advantage there too. 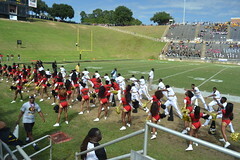 Both bands pleased the crowd by playing a number of current hits, including Memphian Snootie Wild’s “Yayo”. 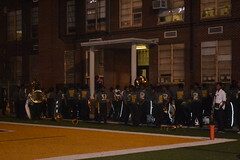 On Sunday evening, January 20, the buses took us to Baltimore’s Inner Harbor for dinner. 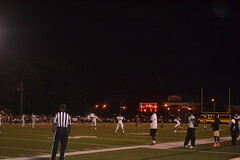 While some of our group went to Phillips Seafood, I decided to go to the Cheesecake Factory, which has always been one of my favorite restaurants. 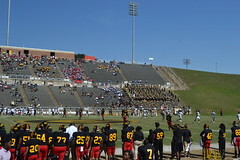 Upstairs, Uno’s Chicago Pizza had the Ravens game on, and I walked upstairs to watch it just as Tom Brady threw an interception that helped seal the game for the Ravens. 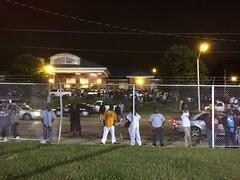 Within a minute after the end of the game, horns starting honking all over the downtown area, and cars began racing down Pratt Street with heads sticking out of sunroofs and Ravens banners waving. 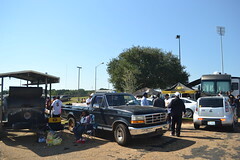 Revelers in Ravens gear also began to appear on the street, and one vehicle had a paper-mache Ravens player on their car roof!. 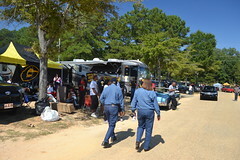 The police soon arrived as well and started pulling some of the more excessive partiers over and writing them tickets. 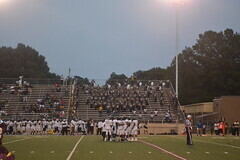 We had by this point gotten back on the bus for the ride back to our hotel. 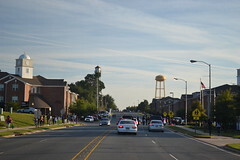 Our hotel was about 18 miles from downtown Baltimore, but fortunately, there was a large shopping mall across the street called Hunt Valley Town Center. 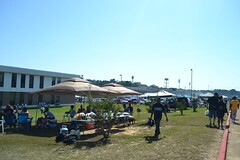 There were quite a few restaurants, a coffee bar, an Italian dessert cafe, a specialty book and gift shop where I found a Ray Lewis shirt for my best friend who’s a Ravens fan, and a cool burger joint called Boardwalk Burgers and Fries, where I grabbed a late lunch before the restaurant closed early due to the Ravens/Patriots playoff game. 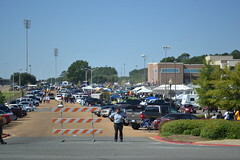 Actually, all around the shopping center were evidences of Ravens mania. 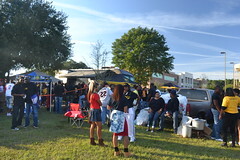 Not only were many of the customers wearing Ravens shirts, but the shopping center had placed Ravens gear on the two decorative statues of horses in the central park of the center.